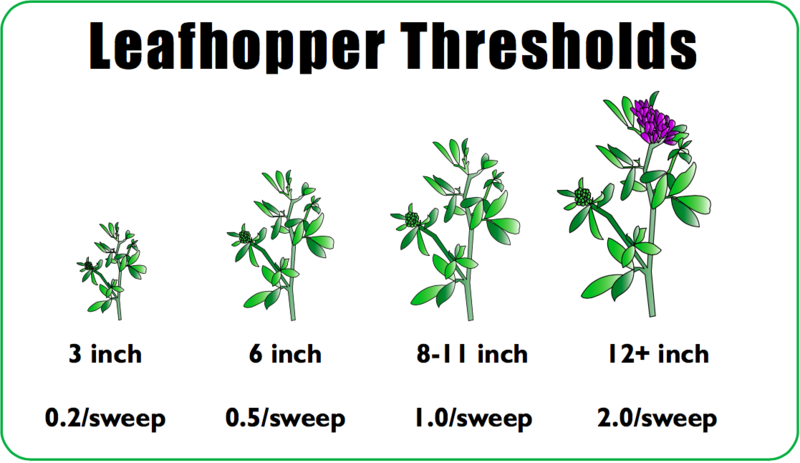 Weekly Scouting – 20 sweeps at 5 locations in each alfalfa field. Because leafhopper population densities vary from year to year and from field to field, the only way to accurately determine damage potential is by monitoring fields on a weekly schedule. Start scouting 5-7 days after first cut. Use a standard 15-inch diameter insect sweep net. Walk a W-shaped pattern in the field and take twenty consecutive sweeps in each of five randomly selected areas. Keep a running totally of the number of leafhoppers caught. Count adults and nymphs. Divide the field total by 100. Compare the field counts with the threshold based on crop height. If over the threshold, decide on spraying or cutting. Continue to the next field. After cutting a field over threshold, scout the regrowth. Start scouting sooner if nymphs were present.